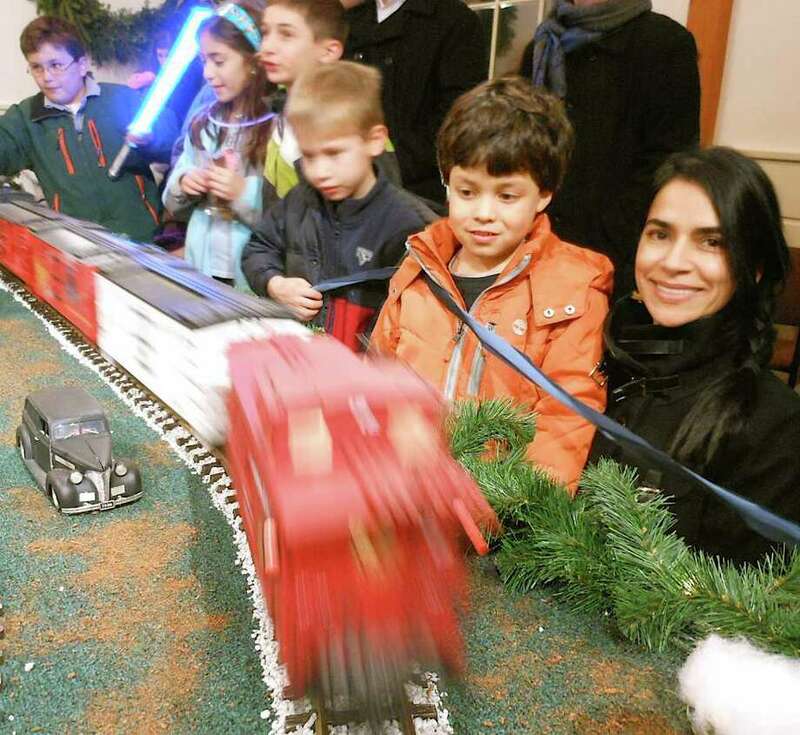 Diana Cadan and her son, Mateo, of Fairfield, foreground, enjoy the Holiday Express Train Show at the Fairfield Museum and History Center when it was unveiled for the season Friday. As the town's Christmas tree was illuminated Friday evening and revelers began leaving the festivities on Town Hall Green, many followed a candlelit path to another highlight of Fairfield's holiday season kickoff: the Holiday Express Train Show at the Fairfield Museum and History Center. The annual exhibit, coordinated by Fairfield-based Housatonic Model Railroad Club and the Connecticut G-Scalers Club, features model trains chugging around a spectacularly decorated tree and through detail-precise holiday scenery and vignettes. A mini camera mounted on one train even offers a train's-eye perspective, with live footage broadcast on an adjacent monitor. Parents and children alike took delight in the display, peering along lengths of track as locomotives rounded corners and zoomed down straightaways. For many adults, the show brought back fond remembrances of their childhood train sets. For youngsters, it planted a seed of inspiration, setting off a desire for their own home sets, which they hoped to find underneath their Christmas trees. Weekends: Saturday and Sunday through Dec. 31, noon to 4 p.m. Weekdays: Monday through Friday, Dec. 23, 11 a.m. to 1 p.m.